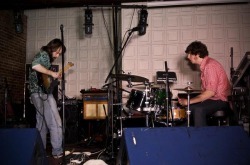 Mark Boyd (Guitar, Synth, Vocals) and Drew Veres (Drums, Synth), formed King Tut in the summer of 2006 in Bay Village, Ohio, a suburb of Cleveland. From the beginning, their live shows were loud, intense, and full of rhythmic complexity. When the summer ended, Drew went back to finish his senior year in high school, and Mark went back for his sophomore year at Kenyon College. Though apart, Mark and Drew practiced daily and played with other musicians, all the while, as The Postal Service did, working on the songs for their first album, Chopping Wood & Carrying Water. The album features 21 songs, just shy of 80 minutes, and was the first release of the Boston-based start-up label, Amaro Dolce. Recorded almost entirely in GarageBand, and often with the in-screen Apple Laptop microphone, the album style ranges from intense, speedy folk, to happy, hard-hitting electro, as well as a few examples of their swelling, organic "live" rock sound. As they gained more popularity, mostly on the internet (thanks to their practice of giving away all of their 70+ songs for free), Mark and Drew decided to take a year off of school and play music in Asheville, North Carolina. While in North Carolina, King Tut entered their song, What You're After, to BBC's Next Big Thing Contest, and made it into the top 20 out of 2,000 entries from 80 different countries. Both Mark and Drew then went back to school: Mark to the University of North Carolina at Asheville, where he studies Environmental Science, and Drew to Tri-C's Recording program in Cleveland, Ohio. 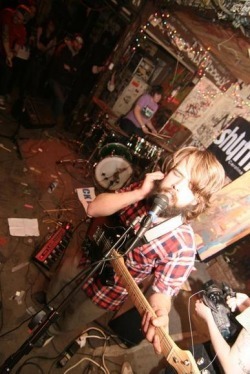 In the Spring of 2009, King Tut recorded two songs from their live set at Altamont Recording, a professional studio in Asheville, which they plan on pressing as a 7" EP and self-releasing in early 2010. Drew has moved back to Ohio to go to school but is still collaborating with Mark through the internet. Currently, Erica Schinasi (violin) has joined Mark and Drew, working closely on a new album that infuses improvisation into composition in a novel way using Ableton 8.0 as an essential tool. Jason - Drums: "Let's Find Out (How To Be Cool)"
Hannah Richardson - Vocals: "Love Is A Feeling..."
Gregory Potter - Harmonium, Trumpet: "Love Is A Feeling..."
John Zahorian - Programming "1000 Dancing Machines Celebrate Their Newfound Self-Awareness"
Lorca LH - Vocals: "Let's Find Out (How To Be Cool)"
Erica Schnasi - Violin: "Let's Find Out (How To Be Cool)"